What lettering would you like personalised on the lid of the box and score pad cover? 12 characters maximum. First 5 characters are included in the price. 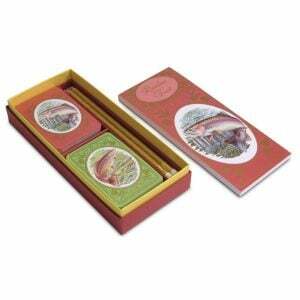 The Emporium Gift Set Petrol and Pink has everything you need for a good game of rubber bridge. The set contains a twin pack of regular-size bridge cards, 4 full length gold pencils and one decorative score pad for rubber bridge. The products come beautifully packaged in a handmade drop-lid presentation box. We refer to the bridge set as ‘Mini’ because it contains just one pad of score cards. Having just one pad, the box is quite compact which is easy to store and doesn’t take up much room. This elegant set has two packs of Emporium Premium Quality 330gsm playing cards for optimum slip, snap and handling. Containing rose pink and petrol blue packs, Emporium cards are the best quality. To read more about playing card board and what makes a pack top-quality, you can read our article Focus On: Playing Card Qualities. The Emporium Gift Set Petrol and Pink has a choice of score pad. Select between Chicago or rubber bridge. Also, we offer a pad of plain paper for non-bridge players. For help scoring your games of rubber and Chicago bridge correctly, see our Scoring Tables.